Scientists have created a tractor beam that can drag objects for distances of up to 20cm - around 100 times further than in previous experiments. In future, these beams could be used to study atmospheric pollutants, or to retrieve delicate particles of material for examination. Previous tractor beam experiments used the momentum of light particles (or photons) to impart motion. But this latest device relies on the energy of the laser heating up the particles and the air around them. 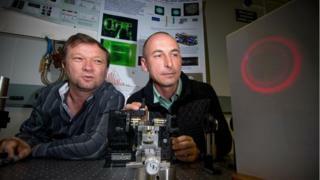 The researchers used a so-called hollow laser beam in a laboratory at the Australian National University (ANU) in Canberra. The laser is bright around the edges and dark at its centre. They then used it to manipulate hollow glass spheres about a fifth of a millimetre across. The particles are trapped in the dark centre of the beam. Energy from the laser hits the particle and travels across its surface, where it is absorbed creating hotspots on the surface. Air particles colliding with the hotspots heat up and shoot away from the surface, which causes the particle to recoil in the opposite direction. By changing the laser beam's polarisation (the direction in which the light waves vibrate) they were able to move the position of the hotspot to manipulate the glass spheres. "We can move smoothly from one polarisation to another and thereby stop the particle or reverse its direction at will," said co-author Dr Cyril Hnatovsky from ANU. The technique used by the researchers is versatile because it requires only a single beam to push or pull the objects. "Because lasers retain their beam quality for such long distances, this could work over metres. Our lab just was not big enough to show it," said co-author Dr Vladlen Shvedov, also from ANU.